The Geraniaceae is a widely-distributed family of herbs with 7 genera containing around 800 species, often with hairy stems and cleft or compound leaves containing aromatic oils. Flowers generally have 5 sepals, 5 petals, 5 - 10 stamens and 5 fused carpels that separate when fruiting. 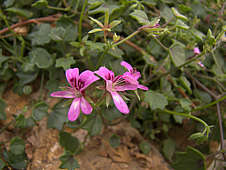 Species currently in the genera Pelargonium and Erodium were originally included in the genus Geranium by Linnaeus, but were separated into separate genera by Charles L'Héritier (1789). 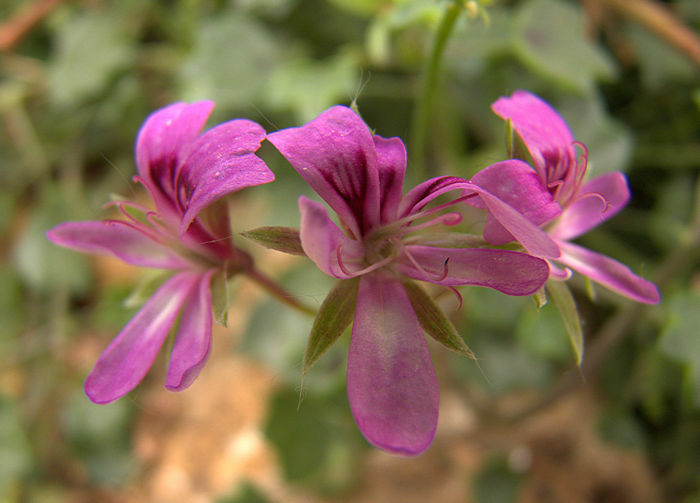 However, "Geranium" persists in the horticultural world as a popular name for Pelargoniums. Geraniaceae are widely cultivated for their horticultural merit and considerable effort has been put into producing a wide range of colours and leaf and flower forms. The genus Erodium (Storksbills) (60 species) has symmetrical flowers with 5 stamens. 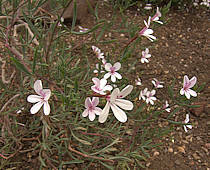 They include small hardy alpine plants suitable for rockeries. Some species develop bonsail-like woody stems. The genus Geranium (Cranesbills) (422 species) has symmetrical flowers with 10 stamens. 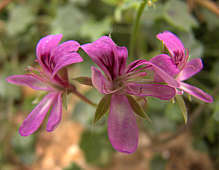 Geraniums are found in temperate and sub-tropical regions especially the Eastern Mediterranean and include many hardy garden plants and weeds. The common name refers to the shape of the seedpods. 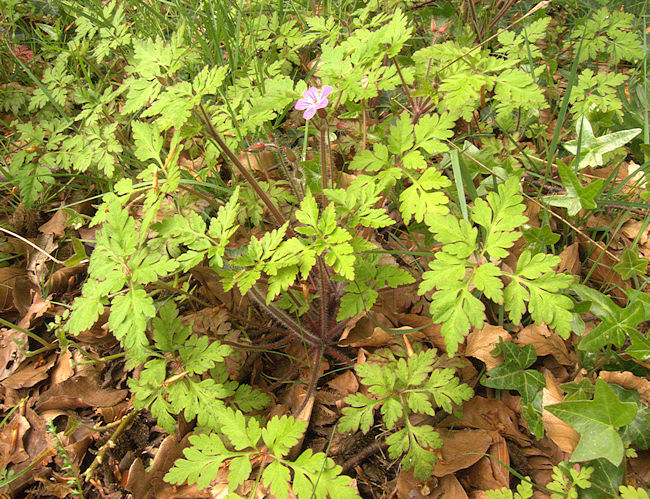 Above left: The hairy stems of English native Geranium robertianum "Herb Robert" are surprisingly succulent. 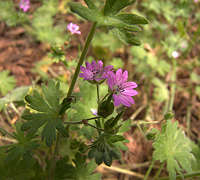 Above right: Geranium pyrenaicum "Pyrenean Cranesbill"
Pelargoniums (280 species) have asymmetrical flowers with 7 stamens. 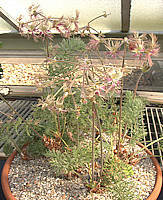 Choice succulent and caudiciform plants are found in the genera Pelargonium and Monsonia (Sarcocaulon), with both summer and winter growers. Monsonia flowers have 15 stamens. This is the largest species of Geranium with purple woody stems supporting a 3ft diameter umbrella of glossy green, highly dissected leaves. 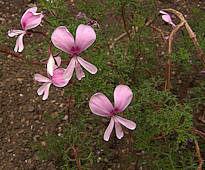 Flowering is generally on a biennial basis after which the plant usually dies (monocarpic), but in moist climates the large head of pink flowers with wine-dark centres may be produced within a year. Flower stalks have sticky hairs. Native to the Madeira Islands. Needs a mostly frost-free Winter, but could be used as Summer bedding in their second year. A white cultivar is in circulation. Name: Greek pelargos = stork, referring to the seed pods that resemble storks' bill's. A large genus of 280 species of which the majority are native to South Africa. They are popular undemanding flowering plants ranging from non-succulent herbs to shrubby plants with fleshy leaves, stems and roots or tubers that may be of interest to collectors of caudiciform plants. The stems of a few species are armoured with spines. 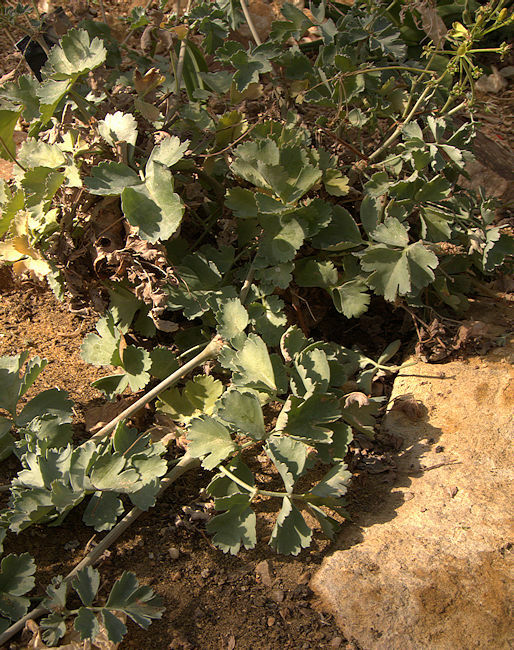 In many species leaves and stems are pubescent. 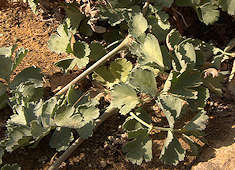 Leaves are usually alternate and either palmately lobed or pinnate, often with long petioles. The leaf surface may be patterned with light or dark zones. The five-petalled flowers are asymmetrical and most colours can be found among the various species. 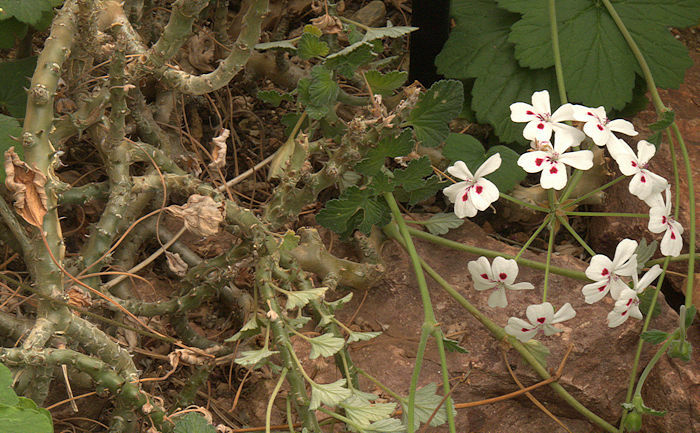 Pelargoniums are important ornamental plants, although the horticultural trade focuses on mainly non-succulent cultivars, with a limited genetic base representing just a handful of the wild species. Numerous cultivars and hybrids are available in a wide range of colours including shades of purple, maroon, red, pink and white and variegated petals. Yellow(ish) flowers are a recent development in horticultural varieties although present in several species e.g P. gibbosum. 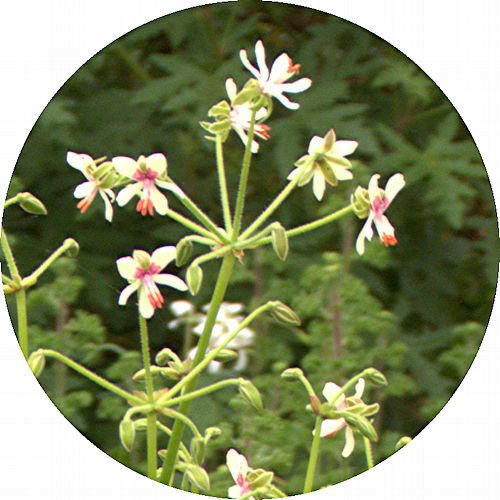 Many species of Pelargonium, especially P. graveolens, produce aromatic oils with aromas including rose, mint, citrus, apple and nutmeg. The most commercially important cultivars are rose scented. 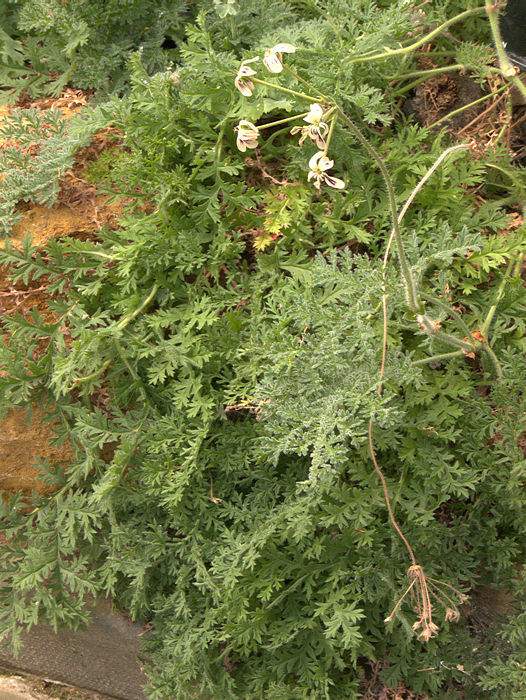 P. graveolens is cultivated on a large scale as a source of essential oils for manufacture of perfumes. Succulent Pelargoniums should be potted up in a free-draining compost which should be allowed to dry out between waterings. Pelargoniums can be propagated from stem cuttings, which should be cut just below a leaf joint, from where the new roots will form. Named for: Henry Bowker, 19th C. soldier & naturalist, who collected the plant. 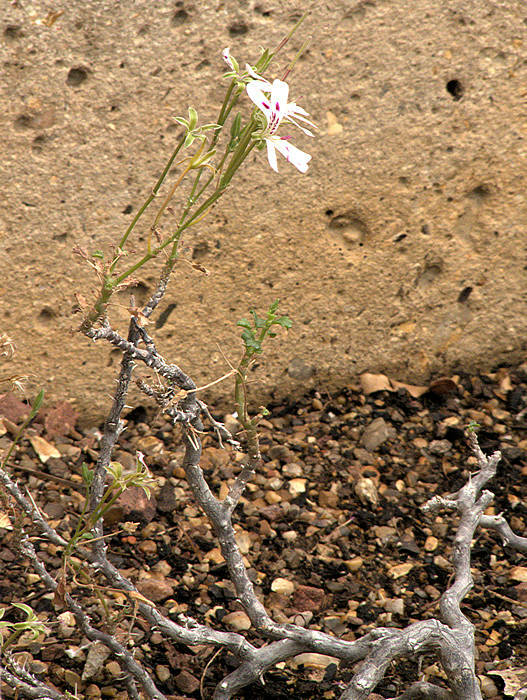 A geophytic succulent plant with a mass of pinnate feathery leaves growing from a large underground tuber. 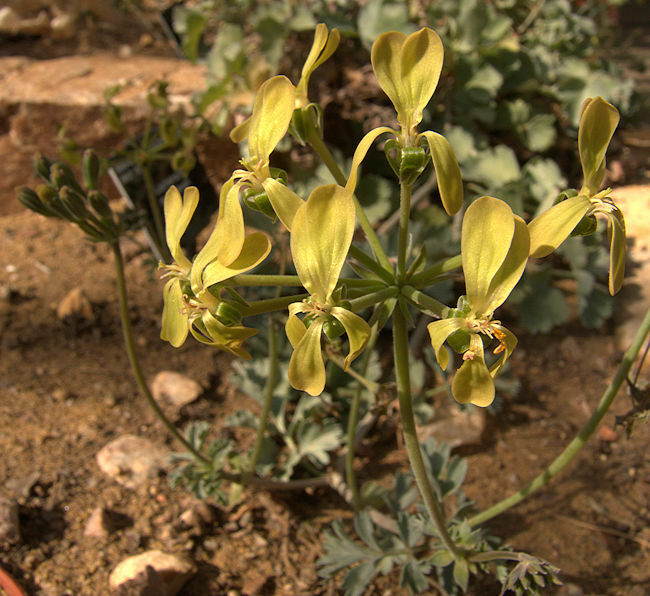 The inflorescence is a cluster of light yellow-green flowers held close to the leaves. Name: Latin: fleshy, succulent, referring to the stems. 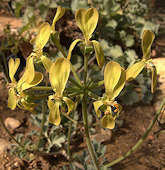 A variable, shrubby succulent plant with thick, waxy yellow-green stems up to 4 ft tall and a thickened root. 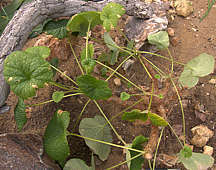 The bipinnate leaves are crisped to a variable extent and produced in tufts from growing points along the stem. The inflorescence is a cluster of white flowers with bright pink style and stamens with orange pollen. Native to the North-Western Cape of South Africa. Name: with leaves resembling cotyledons. 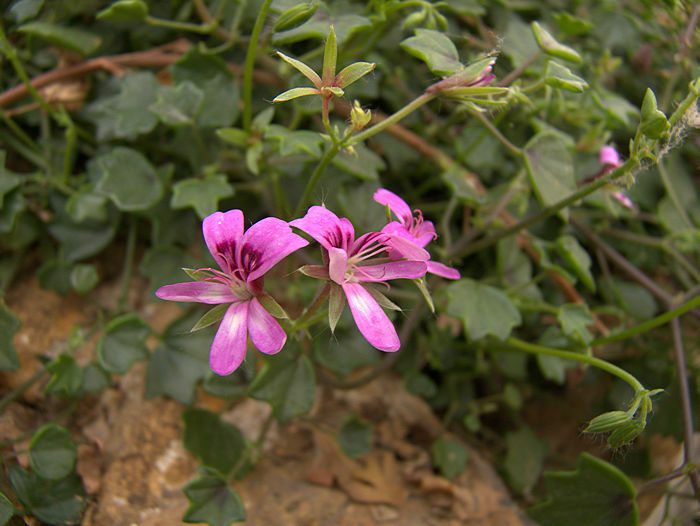 This slow-growing shrubby plant has a few thickened, succulent branches. 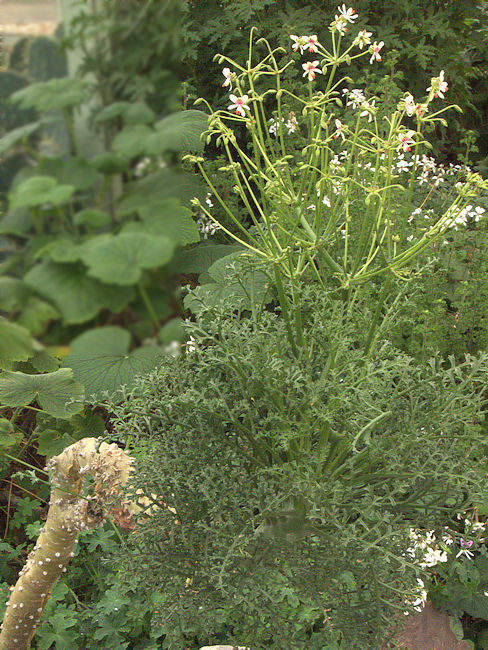 The simple, heavily veined leaves are deciduous during the Summer and produced around the growing tips of the stems. The inflorescence is a cluster of relatively large white flowers on a long stalk, with white style, stamens and pollen. 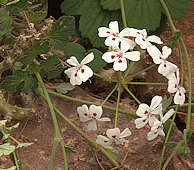 Endemic to the island of St. Helena where it is the only species of Pelargonium, but threatened due to predation by goats and encroachment by invasive introduced New Zealand Flax. This shrubby succulent plant has thick knobbly stems to about 2 ft tall. 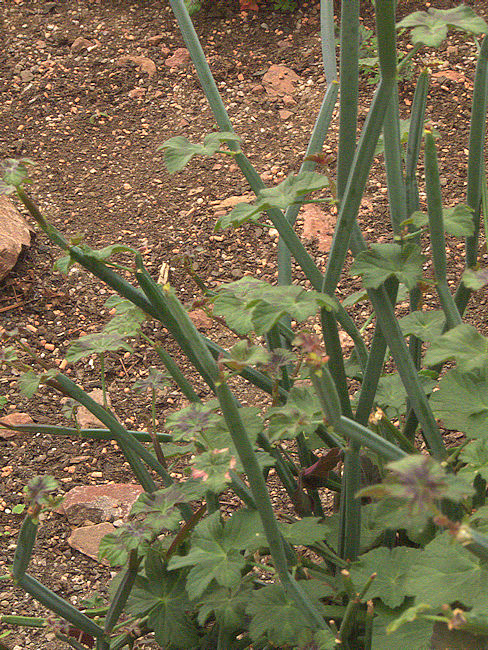 The succulent, bipinnate leaves are produced in tufts at growing points on the stem. The inflorescence is a cluster of white flowers with pink markings on the base of the upper pair of petals, a red style and stamens with yellow pollen. 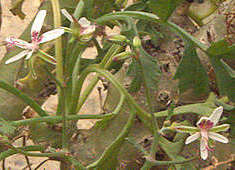 Native to an wide area from Namibia to the North-Western Cape. 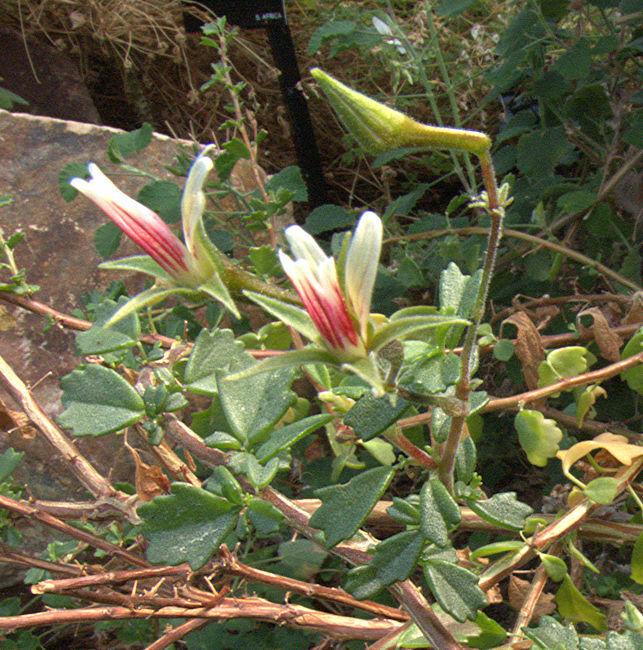 A decibuous shrubby plant with smooth stems and aromatic small 5-lobed leaves. 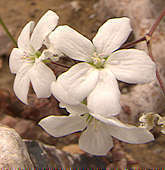 The flowers have white petals with a purple tinge and purple stamens with orange pollen. Name: Latin: Echinatum = furnished with spines. 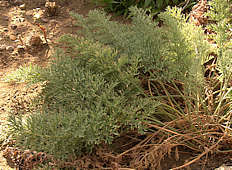 This shrubby succulent plant grows up to 3 ft high, with thick, sprawling stems furnished with thorns, originating as persistent recurved stipules. Roots are tuberous. The Summer-deciduous leaves are heart shaped with crenate margins. The inflorescence is a globular cluster of white to pink flowers with red blotches of variable size near the base of the petals. 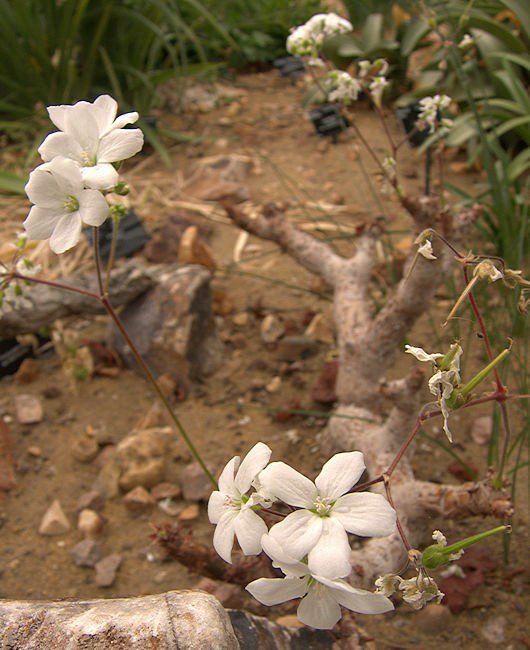 Native to the rocky soils and cliffs of the South African Richtersveld. In cultivation, water should be withdrawn during the Summer to allow the plant to rest. 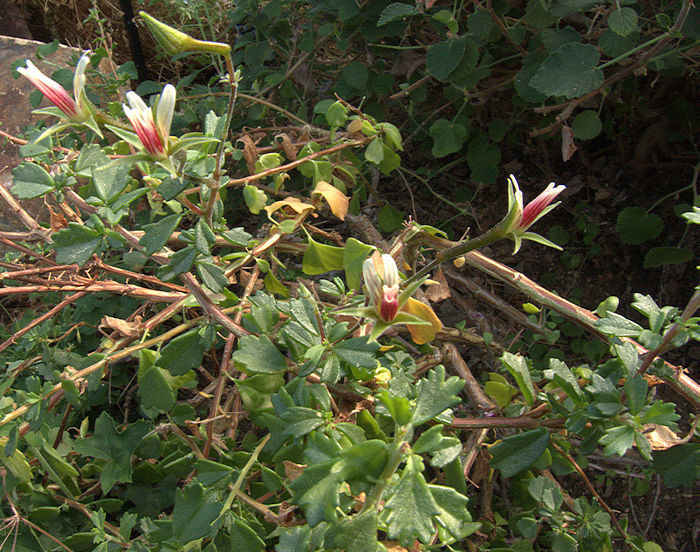 This shrubby species has smooth brown stems with slightly succulent, highly-divided trifoliate bright-green leaves. 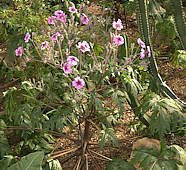 Flower stalks carry two or three pale to dark pink flowers with darker pink central markings. 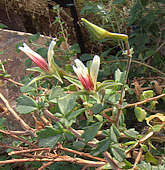 Native to the Southern Cape of South Africa. Name: Latin: gibbosum = unevenly swollen, referring to the stem nodes. 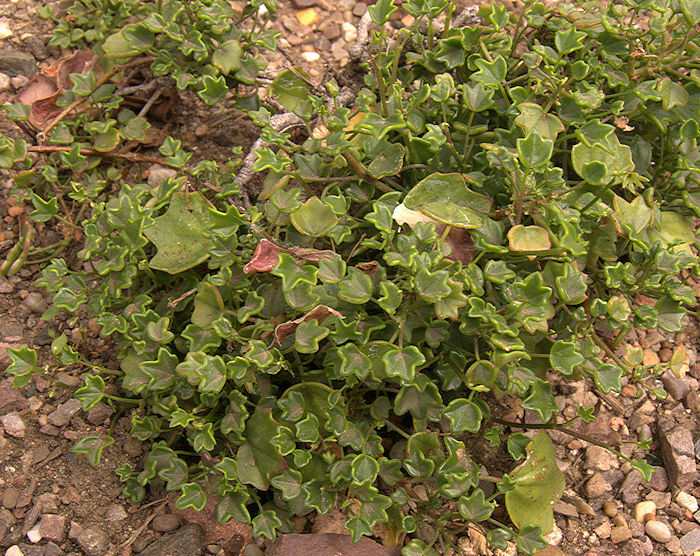 A sprawling sub-shrub with thickened stems producing a mass of annual growth with glaucous semi-succulent pinnate leaves. The inflorescence is a panicle of night-scented yellow flowers, contrasting nicely with the foliage. Native to the coastal Western Cape of South Africa. 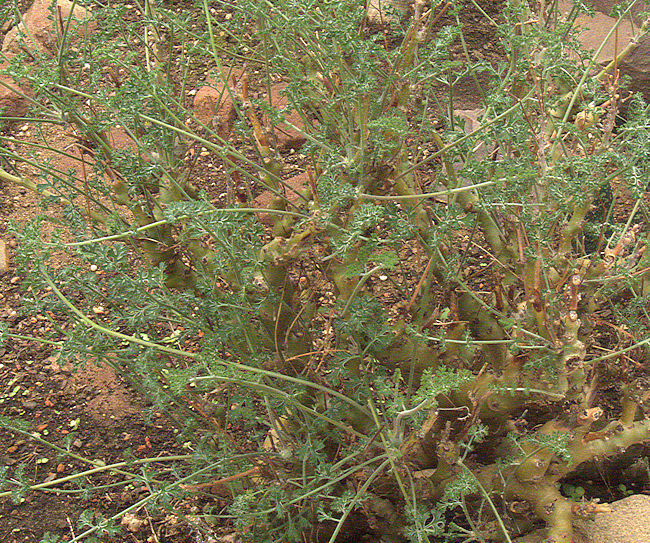 A woody shrub whose stems bear succulent pinnate leaves. 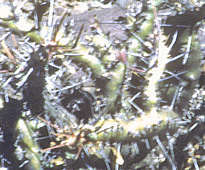 Persistent petioles along the stems give the appearance of spines. 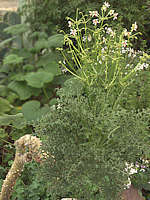 The foliage is delightfully aromatic, somewhat reminiscent of the herb Thyme. 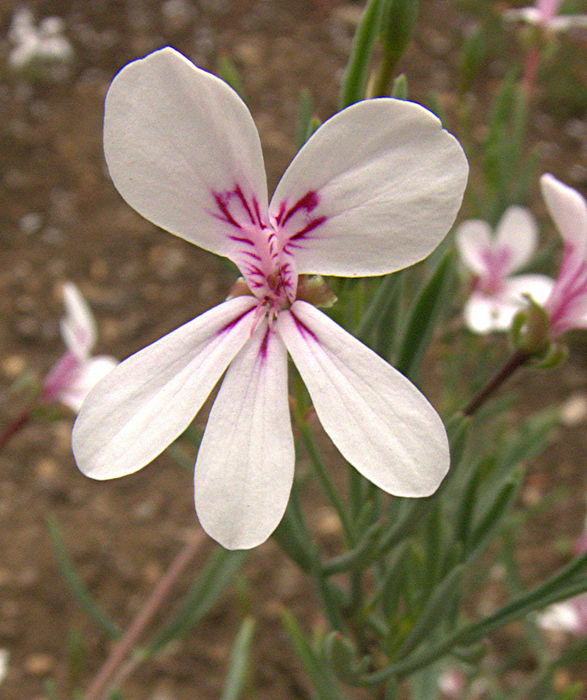 The small flowers are white to pale yellow with fine red markings on the upper petals. Native to Namibia and the North-Western Cape of South Africa. 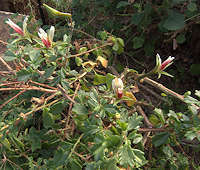 A borderline succulent shrubby plant with smooth reddish-brown stems and narrow lanceolate to trifoliate leaves that are lightly inrolled. 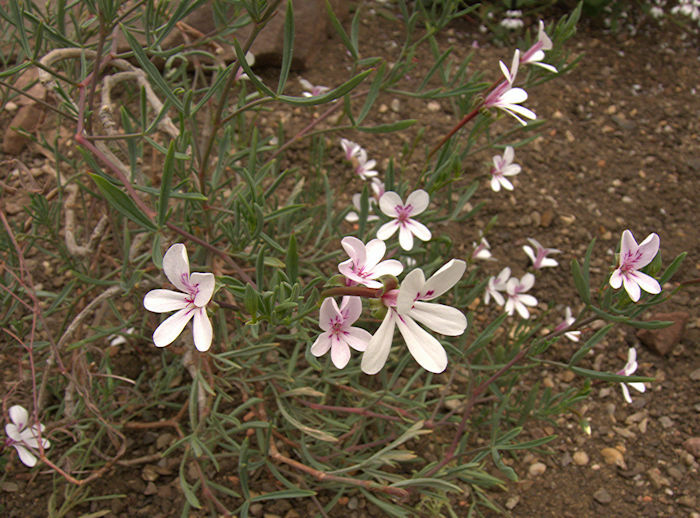 The flowers have white, cream or pink petals with central reddish-purple markings and pink stamens. The seeds have a spirally-coiled tail that enables them to drill into the ground as the wind makes the spiral rotate. 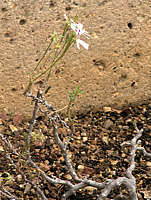 An infrequently-branching succulent shrub with a thick 3ft trunk patterned with persistent petioles and bearing a head of pinnate succulent leaves. Leaves are deciduous during the Summer. 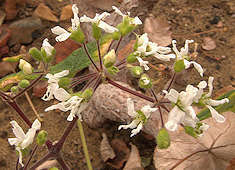 The inflorescence is a panicle of small white flowers with pink markings on the base of the upper pair of petals, a white style and stamens with orange pollen. 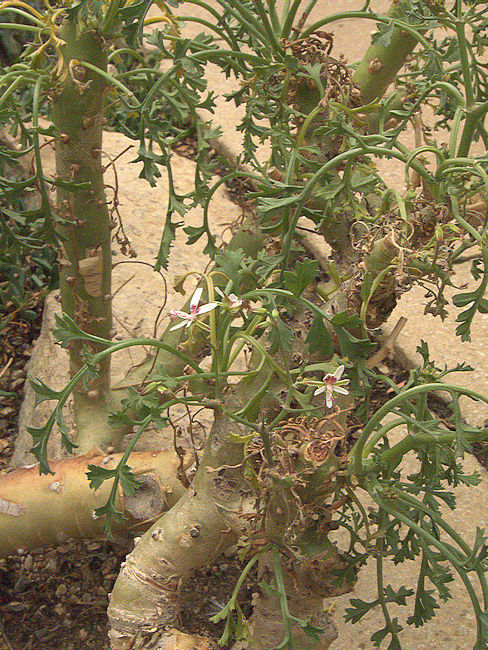 A scrambling succulent plant with small, fleshy 5-lobed peltate leaves which may exhibit some zonation. Flower buds are quite hairy. 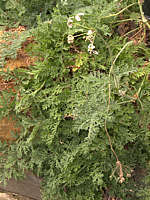 Other parts are generally smooth, although hairy-leaved plants are known from the Eastern Cape. Native to the coastal tip of the South African Cape. 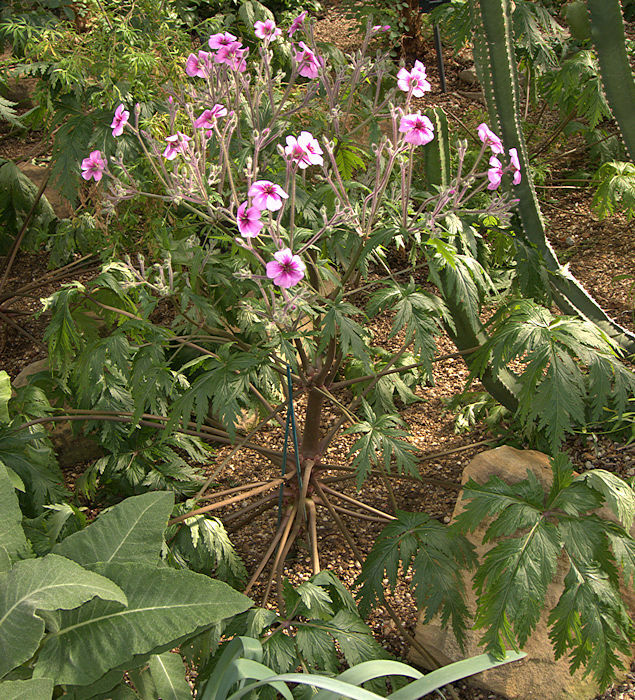 This plant is ancestral to many horticultural varieties. 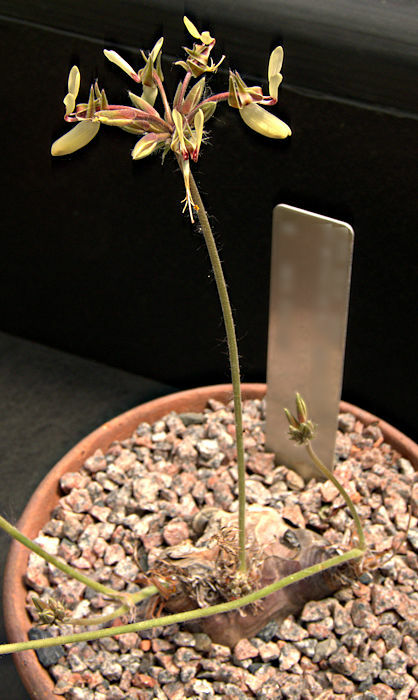 Pelargonium lateripes differs from P. peltatum only by having cordate leaves. Name: Latin rapa = turnip, referring to the shape of the tuber. 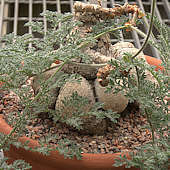 This geophytic succulent with a caudex up to 8in in diameter, produces a tuft of pinnate, highly divided leaves during the Winter growing season. 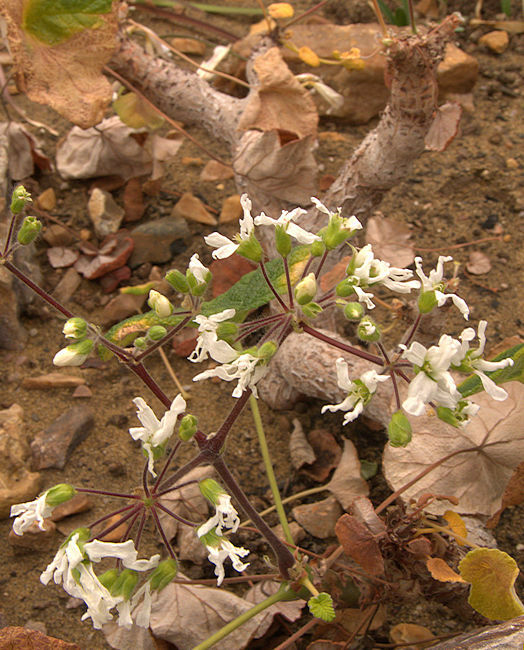 In Summer after the leaves have died, flower stems appear bearing a cluster of white to yellow flowers with red petioles. The upper petals are reflexed and marked with red. 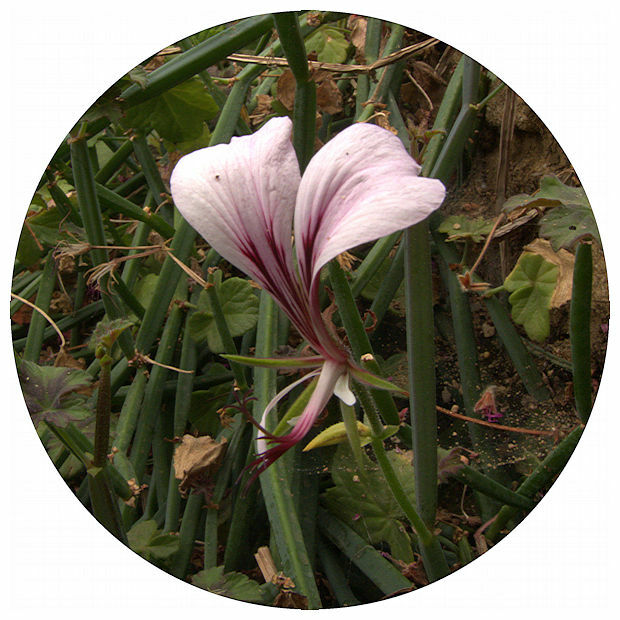 Widely distributed along the coast of Western South Africa. Name: Saxifragoides means 'resembling a saxifrage' presumably referring to the dwarf habit. 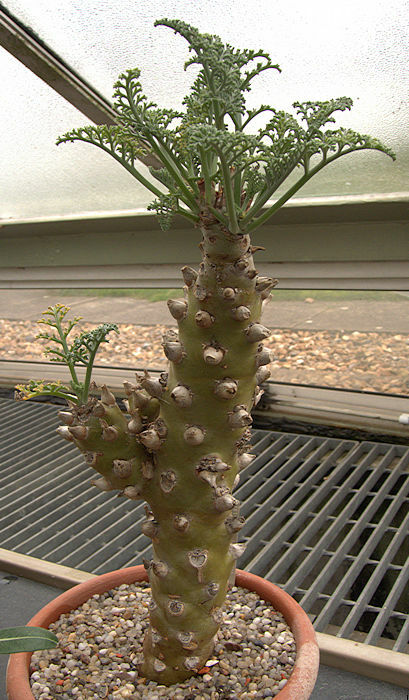 This succulent plant is thought to be of garden origin having been discovered in 1888 growing in the Royal Horticultural Society's garden at Chiswick, but without any record of its origin. It is probably a hybrid of P. peltatum. The small dark green fleshy leaves have slightly thickened edges. 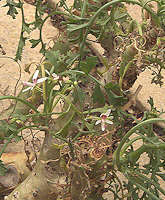 A scrambling plant with branching three or four-angled succulent stems producing non-succulent deciduous leaves at the stem joints. 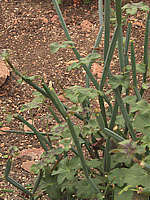 Leaves may have zonal markings and a degree of pubescence. The inflorescence is a cluster of cream to pink flowers the upper petal of which has red markings. Native to the South African Cape. 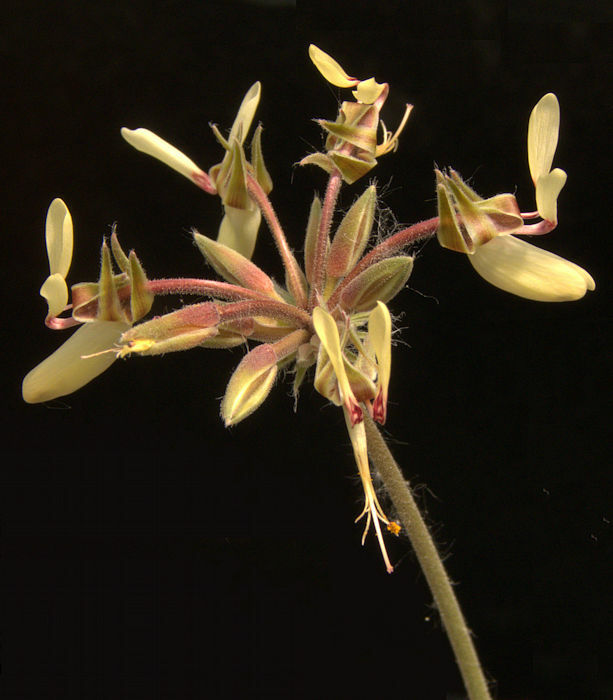 This is one of the few species with succulent stems that is widely available in the horticultural trade although the foliage is not aromatic. 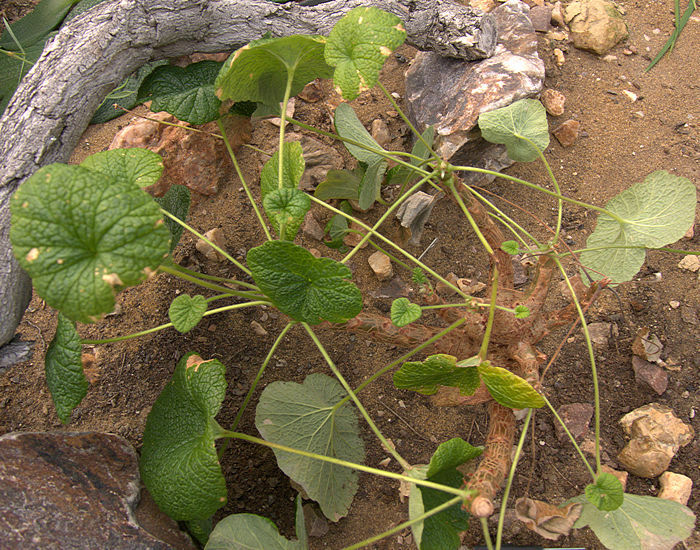 The large pinnate leaves hide a substantial caudex and a spreading, tuberous root from which the seasonal foliage arises. Leaf structure and hairyness of leaves and stems is quite variable. Native to the Western and South-Western Cape of South Africa. 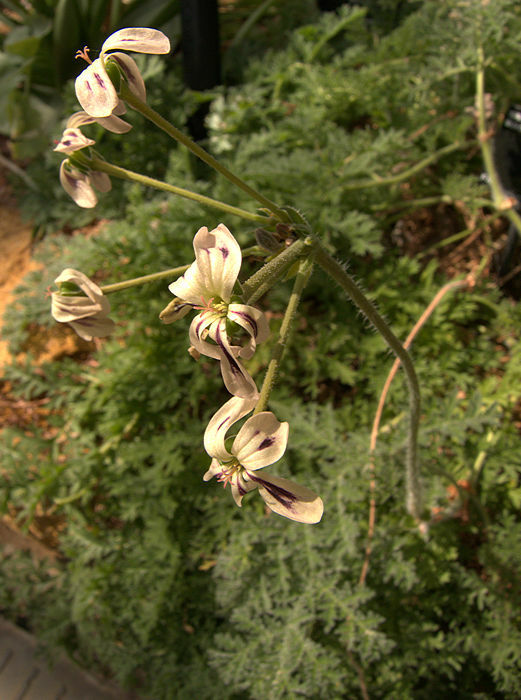 One of the first South African Pelargoniums to be brought to England by John Tradescant in 1632. 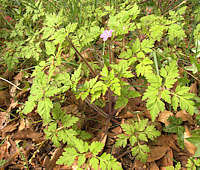 Originally described by Linnaeus as Geranium triste. 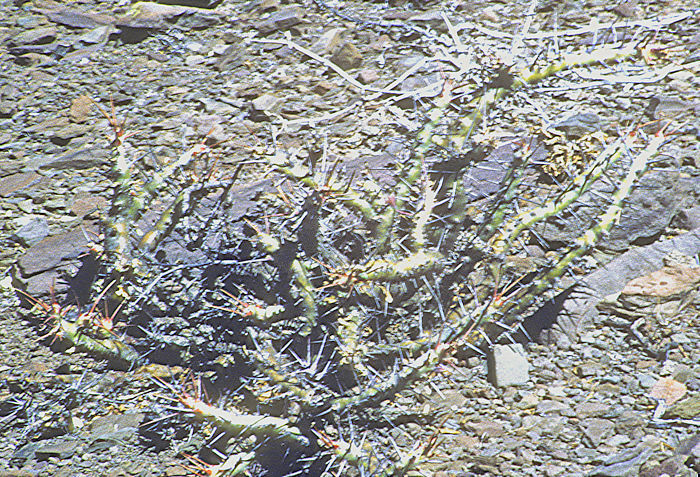 A group of erect, woody sub-shrubs, some with a degree of stem or root succulence, waxy bark and spines. 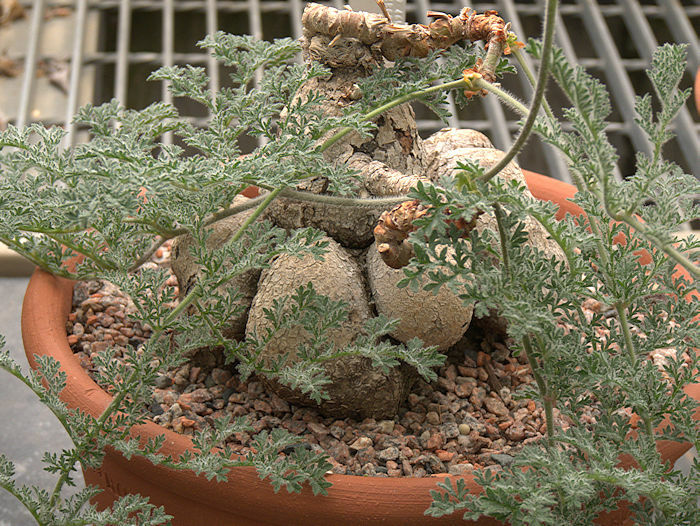 Monsonia has absorbed the former caudiciform genus Sarcocaulon. The waxy bark and resinous exudates of some former Sarcocaulons makes them inflammable even when the stems are green, explaining their common name. Monsonias are native to areas of intense heat and aridity and need strong sunlight and careful watering to survive. Caudiciform Monsonias should be watered when in active growth and very sparingly, or occasionally misted to prevent dehydration, when dormant. Spiny-stemmed Monsonia, North Escarpment, Nieuwoudtville, RSA. 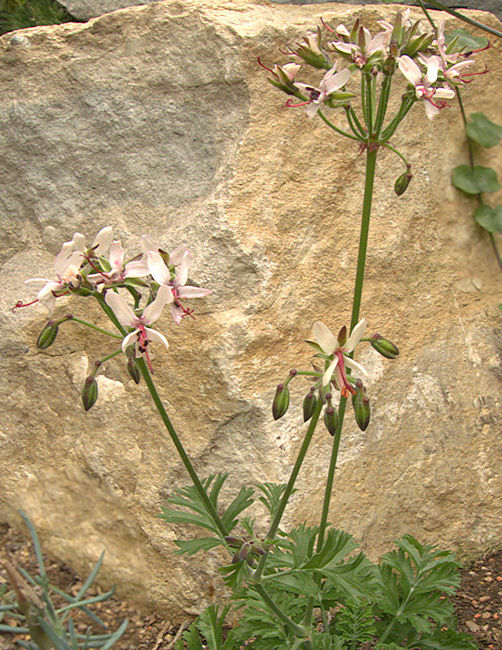 This stem succulent has small pink flowers, one of which can just be seen in the photograph. The wicked spines are a deterrent to herbivores in this arid environment.